Game Table — TRANSFORMING DESIGNS INC. 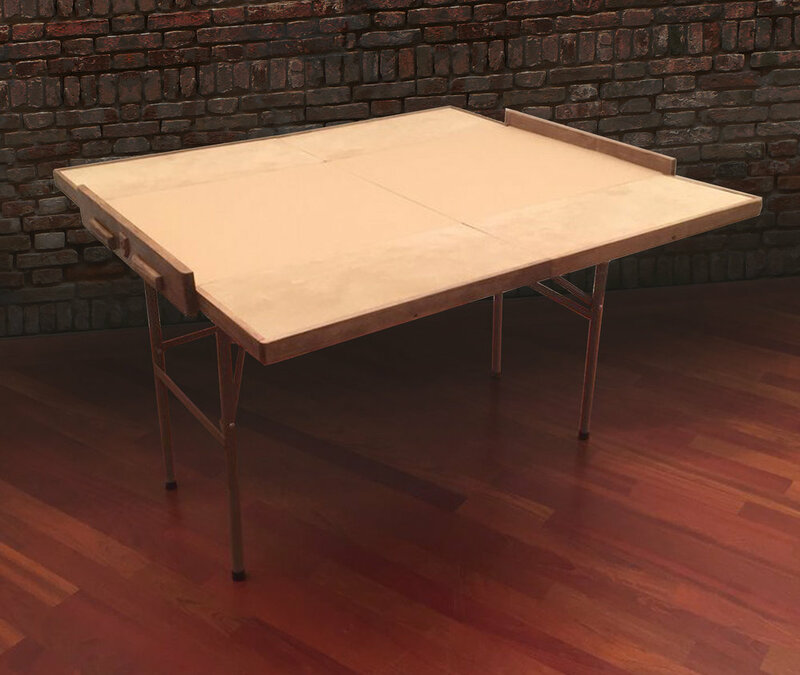 The Game Anywhere table is the first full size gaming table that is lightweight and 100% portable. Designed with more than just the game in mind, we had the player in mind as well. With our innovative patent pending design, the Game Anywhere Table features four player stations with magnetic player panels. To go with that we have designed a full line of magnetic player panel accessories. With this innovative design each player can customize their own player station to display their game cards and game pieces in any arrangement they want. Making game night a much better gaming experience for all types of games. Whether you want to play your favorite card or board game The Game Anywhere Table gives you the power to travel and game your way. Because this table has all these new and exciting features weighing less than 45 pounds and can be folded to the size of a standard piece of luggage. The Game Anywhere table goes with you to a friends house, a hotel room or even camping. The Game Anywhere table is a full size gaming table you can set up in minutes and play for hours. Then can be transformed back to its compact size to take with you, be placed in a closet, under a bed or just out of the way. The table also can come with 4 cup holders that tuck neatly into the table’s sleek design, and when needed, simply slide out to place your beverage safely in. The Game Anywhere table is the first full size game table that is lightweight and 100% portable. Allowing players to bring their preferred way to game with them where ever they choose to play. The Game Anywhere table has plenty of room for a game board as well as all the player cards and pieces even when using a board game with a large expansion pack. with the games largest expansion pack using a board twice the size of a standard game board. Table Fully Open is 50" x 46" x 31" Tall. Table folds to a 2’ x 2' x 7" compact size for easy storage or taking with. Wood Rails Fully Surround the Table so Dice and Game Pieces don't Fall Off. Canvas Case makes for Easy Carrying and Safe Convenient Storage.